You are currently browsing articles tagged Stowmarket. Last Friday we visited the Museum of East Anglian Life (MEAL) in Stowmarket for the opening of their new temporary exhibition, I Spy the Countryside. 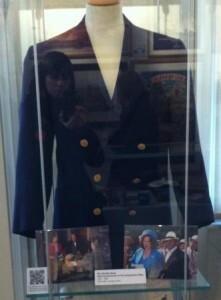 This is MEAL’s incarnation of a loan exhibition put together by MERL called Collecting 20th century rural cultures. 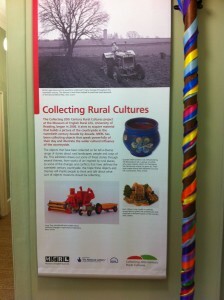 The introductory banner – one of six banners put together by MERL as part of the ‘Collecting 20th century rural cultures’ exhibition which are available for loan. The Collecting 20th century rural cultures project at MERL, which ran from 2008, aimed to acquire objects which build a picture of the English countryside in the twentieth century. The project was funded by the Heritage Lottery Fund’s Collecting Cultures initiative. Over 400 objects were collected during the project – you can read about many of them on the project’s blog. Unlike previous collecting at MERL, which has focused largely on the story of rural technology and crafts, these objects have a more tangential connection to the countryside, exploring representations and perceptions about rural places and people. One of the major outcomes of the project was a temporary exhibition which can be loaned to other museums and institutions. This exhibition, put together by the Sense of Place team, brings together the objects collected during the project into five themes – rural and urban interactions, the countryside as inspiration, representations of the countryside, modernisation, and conflict. These are not definitive, but are the result of our own interpretations of the material that was collected. 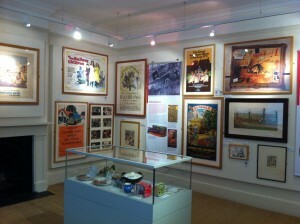 Both MEAL and MERL are rural museums, and share many of the same issues in contemporary collecting. Like Collecting 20th century rural cultures, I Spy the Countryside aims to get people talking about the future of collecting in rural museums. Roy Brigden, who initiated the project at MERL, opened the exhibition and in his opening speech made an excellent point about who determines what museums collect – the donors, as many museums acquire what they are offered, rather than actively seeking objects. 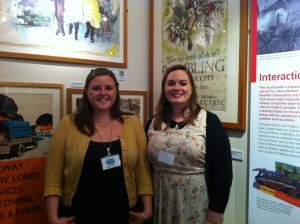 Ele and Izzy, Collections Management and Interpretation Interns at MEAL, who’ve spent the past few weeks working on the exhibition. I Spy the Countryside was installed in two rooms in the newly-opened Abbots Hall at MEAL. It consisted of the six banners from MERL, alongside nearly sixty objects loaned from MERL and some of MEAL’s own collections. The cataloguing work we did in the summer played an important role in enabling MEAL to select the objects they wished to borrow, as all the information we have about the objects was available to view on our online catalogue (type “collecting 20th” into the search box). I really liked the very colourful and ‘full’ feeling the exhibition had, with the walls crammed with paintings and posters, many of which we’d never seen actually seen (as we spend most of our time working from the files). There were several QR codes scattered throughout the exhibition (which Felicity will blog about shortly) and I think it was a good opportunity to learn how similar museums are making use of this technology. Many of the objects acquired by MERL were 2D – we think they look great packed together like this. 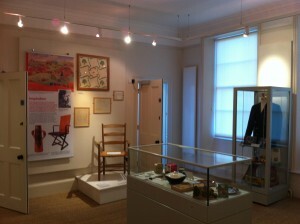 The chair on display in the background was made by Edward Gardiner for the Cragg Sisters’ tearooms in Aldeburgh, Suffolk. MEAL was pleased to welcome a former owner of the tearooms to the exhibition opening, who offered more contextual information about the chair. 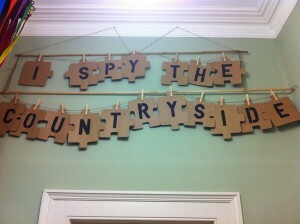 I Spy the Countryside is on display at MEAL until March 2013. Collecting 20th century rural cultures is available for loan to other institutions – if you’re interested in borrowing it or would like more information, please contact us. And if you get a chance to visit the exhibition at MEAL, please comment on the blog and give us your feedback – we’d love to hear your thoughts!